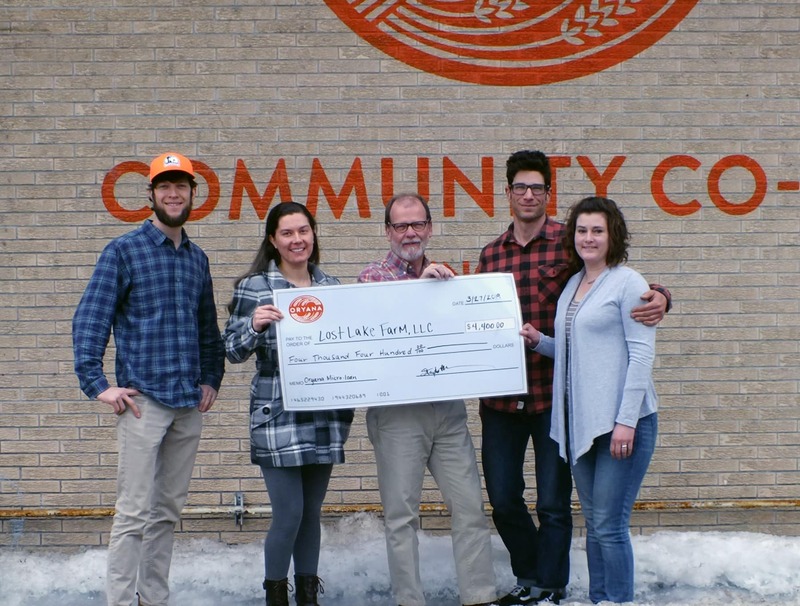 Almost $20,000 was awarded to farmers in Northwest Michigan thanks to an innovative, zero-interest community microloan partnership between Crosshatch Center for Art and Ecology, Grain Train Natural Foods Market and Oryana. Carissa Savage and Nathan Cornell of Lost Lake Farm were given a microloan of $4,400 by to support the purchase of new, efficient hand tools and crop protection materials to improve current vegetable yields. Lost Lake Farm has been in operation for six years and currently produces pasture pork on 8 acres and more than 90 varieties of vegetables on 1.5 acres. This microloan will allow Lost Lake Farm to fulfill the increasing demand for their produce in Benzie County, and it will allow them to provide more food to neighbors in need through Benzie Area Christian Neighbors. Lost Lake Farm produce can be purchased at the Elberta and Frankfort farmers markets from May to October or through a Community Supported Agriculture (CSA) share, picked up at the farm weekly. Farmer Nic Welty of 9 Bean Rows and the Leelanau County-based MI Farm Cooperative has received a $5,600 microloan to cover some of the costs of a refrigerated truck to transport protein and frozen and processed products. The MI Farm Cooperative has identified emerging opportunities for local farm product sales to local schools, especially due to the 10 Cents a Meal for School Kids & Farms program, and this microloan will support expansion in product diversity the co-op can offer schools and other buyers through refrigerated delivery. Patrick and Libby Ives of Bliss Valley Farm LLC have been awarded $5,000 microloan to raise pastured laying hens on their farm this season. Bliss Valley Farms is a small, diversified vegetable farm in Bliss Township. Their farming improvements in the coming season will include moving chickens to forage in garden beds during a cover crop phase and also in surrounding pasture for fertilizing benefit to the soil. For three years, Bliss Valley Farm has built infrastructure to grow food on roughly an acre, and they have developed markets for the sale of their produce that have allowed Patrick to farm full-time. Brendan and Greta Jankoviak of Harvest Thyme Farm & Vineyard in Cheboygan have been awarded a $4,650 microloan. Harvest Thyme Farm is planning to use this community-supported, zero interest loan to build a mobile walk-in cooler in downtown Cheboygan for self-serve pickup of produce for farm-share members. Since 2014, Harvest Thyme Farm has grown to include the sale of vegetables, herbs, flowers and plant starts at farm markets, restaurants and directly to more than 150 farm share families. This project will increase convenience, save on labor costs and increase the availability of their products to members. Farm shares are available for customers in Cheboygan, Indian River, Mackinac Island and St. Ignace and can be arranged online. Between November 2018 and March 2019, farmers, agribusinesses and food business entrepreneurs were invited to apply for this microloan program in 13 counties including Antrim, Charlevoix, Cheboygan, Emmet, Otsego, Leelanau, Benzie, Grand Traverse, Kalkaska, Manistee, Wexford and Missaukee. Representatives from Crosshatch, Grain Train, Oryana and other food and farming entities reviewed applications and decided to fund business project proposals which best exemplified two goals: boosting a farm or food business and elevating the region’s local food system. Crosshatch and Grain Train launched this microloan program in 2016 with the goal to help local food business grow, while also building the area economy and supporting increased availability of local products to consumers. Including this year’s awards, the partnership has awarded $51,240 in microloans. This year, Oryana Community Co-op joined the initiative, designating $10,000 for businesses within 100 miles of their store. This effectively doubled the total annual funds available to farms in northwest Michigan to $20,000, which will be distributed this year. The next microloan application process will kick off once again in November of 2019. Farms and food businesses can keep up with this and other farm training and support programs at www.crosshatch.org.